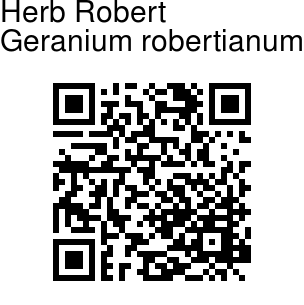 Herb-Robert is a widespread sprawling herb, about 2 ft tall, well-known for its strong disagreeable mousy smell and its cheerful bright pink flowers.This odour is referred to by the common names stinking Robert and stinky Bob. In folklore it is the plant belonging to the mischievous house goblin Robin Goodfellow (the name Robin is a diminutive of Robert). This leafy plant is generally hairy, with bright green finely divided leaves and reddish-tinged stems. Leaves are trisect, 3-4 x 3-7.5 cm, 3-5-angled, segments pinnately cut, lobules blunt, mucronate, sparsely hairy. Leaf-stalks are 1.8-4.4 cm long, hairy. Stipules are 2-3 mm long, broadly ovate, subacuminate. Flowers are borne on glandular-hairy 2-flowered stalks. Sepals are 5-7 mm long, ovate or oblong-ovate, glandular-hairy, needle-tip about 2 mm long. Petals are twice as long as sepals, 3-nerved, reddish-pink, limb obovate, tapering towards the base. Beak 8-11 mm long, glabrous. Mericarps are hairless. Seed are 2 mm long, elliptic-oblong, reddish-brown, umbo slightly projecting, black. 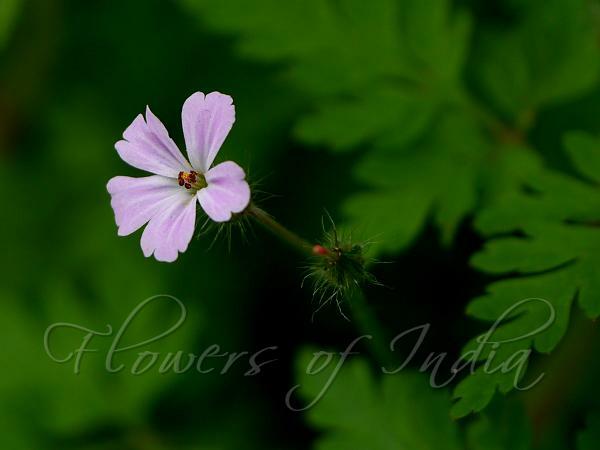 Herb Robert is found in Europe, C. Asia, Himalayas (from Kashmir to Nepal), Siberia, east to China, Japan and America, at altitudes of 900-3300 m. Flowering: May-July.